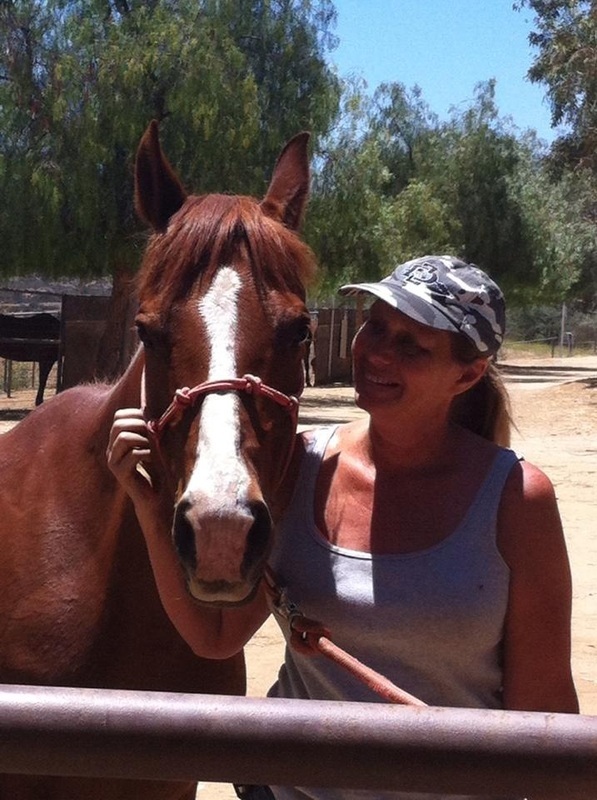 "Always the bridesmaid, never the bride..." For more than a year Lisa Bone, founder of Toby's Legacy has watched Cali get passed over as one horse after another would get adopted. Her personality as sweet as they come and she absolutely adores people, it was hard to understand why Cali wasn't getting the attention she deserved. We knew her time would come. Finally, on May 27, 2013 it was Cali's turn! Potential rescuer Kammi Young-Montanero met Cali and there was no contest. Cali was "the one" and it was finally her turn! We are so happy for Cali and while she will be so missed at Toby's Legacy we are thrilled she finally found her forever family and can begin this wonderful new chapter of her life. In June 2011, Lisa Bone, co-founder of Toby’s Legacy, was contacted by Animal Control regarding two horses abandoned on a property in Lake Elsinore. 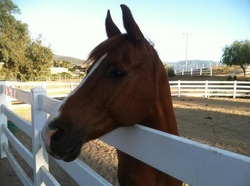 The owners had been evicted and left the horses to fend for themselves in the backyard. 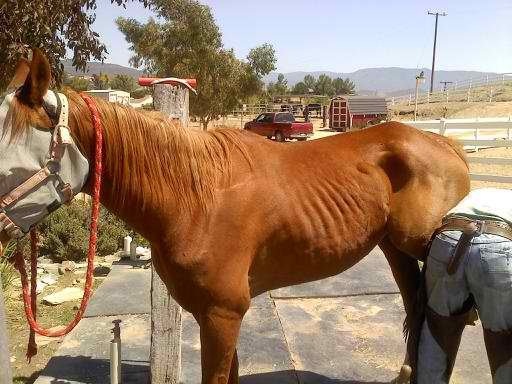 Animal control officers were attending to the horses twice a day to bring food and water. 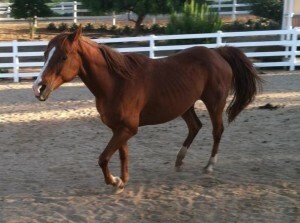 Cali’s mom was emaciated, in her 30’s and a purebred Arabian. Tragically, because of her extreme condition, it was decided euthanasia was most humane thing for her. 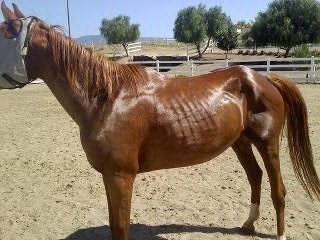 “Cali” a 12-14-year-old Arabian cross was herself thin, caked in mud and feces, and covered in flies. To say she jumped into the trailer would be an understatement. She couldn't wait to leave and Lisa felt so sorry for her. Her mom was all she had ever known and Cali was clearly distraught by her mother’s death earlier that morning. The flies were making her crazy. 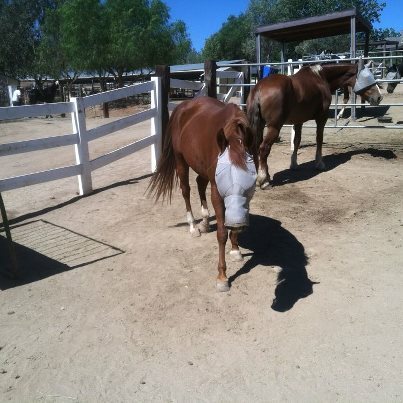 Upon arriving at the ranch, she was immediately given a bath and a fly mask. She had her teeth floated shortly after. The vet said she had the worst teeth he had ever seen. Cali has a “wave” mouth which means it doesn’t occlude properly so teeth don’t wear normally. She had probably never had her teeth floated before and they were long with sharp points causing ulcerations in her mouth. Due to her wave mouth she must have her teeth floated yearly, no exceptions. Shortly after Cali’s arrival, Toby’s Legacy received its third rescue. 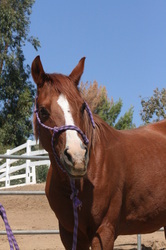 “Mouse” was a small Arabian/Hackney cross and immediately bonded with Cali. The two were inseparable. Lisa had so much empathy for Cali and what she had gone through. 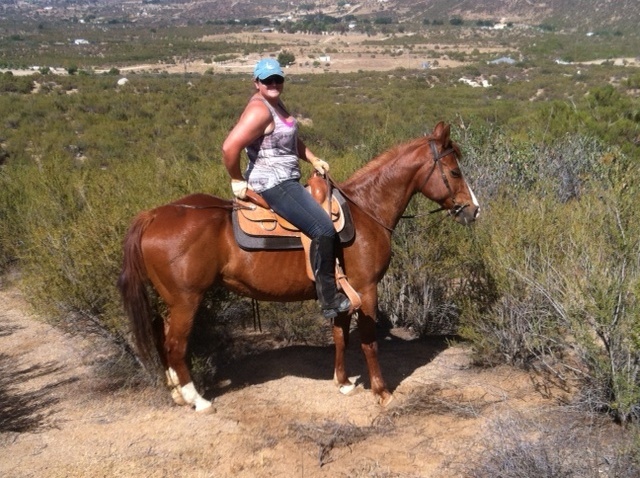 When Mouse was adopted it broke her heart to separate them; Cali has never bonded with another horse the same. Cali loves people. She will drop whatever she is doing to be with you. She wants attention so bad it often translates to being pushy. She rubs her head all over you, wants to hug you all of the time – yes, she hugs – and pretty much invades your personal space. It's what we love about her! She stands tied at the tie rail, trailers well, stands for farrier and baths. 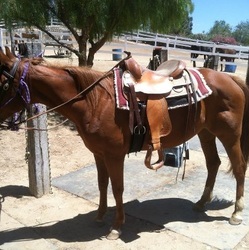 She allows herself to be tacked up but gives you a look that says, “I don’t like it, but I will let you because I love you.” Under saddle she does well at a walk and a trot but does not like to canter. We were informed Cali’s avoidance of the canter is due to weakness in the hind end from being out of shape and it makes her uncomfortable. With conditioning it would probably resolve itself and Toby’s Legacy is currently working on this issue with a trainer. 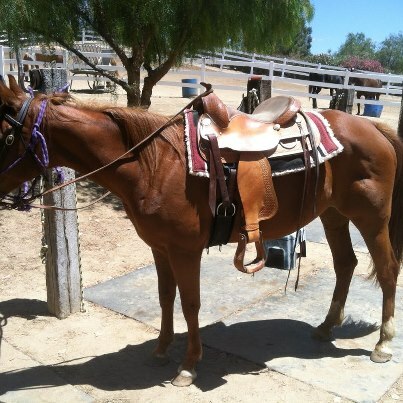 Regardless, she throws out a buck when asked to canter but if you don’t take no for an answer she will do it. Cali was adopted in February 2012. The adopter fell in love with Cali and everyone thought it was a match made on heaven. 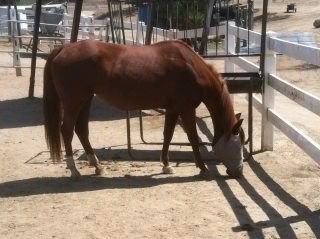 Upon adoption, Cali was kept in a 12x12 stall with no turnout and no other horse within reach. 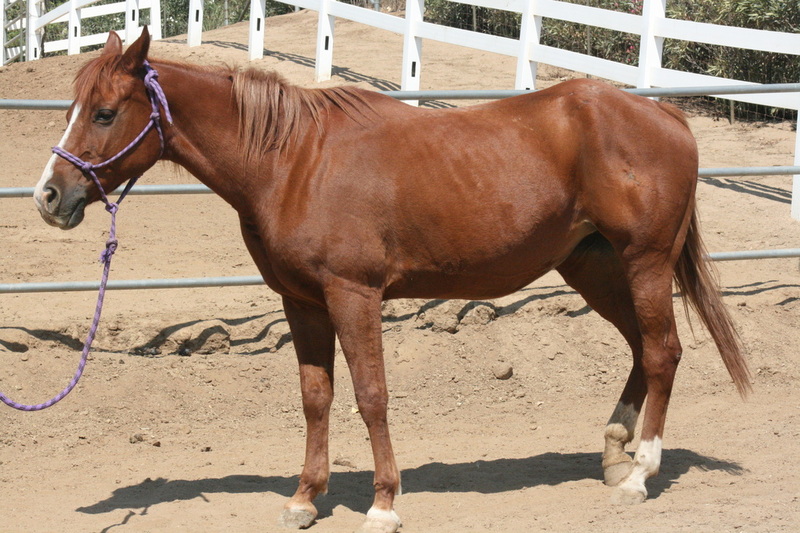 Cali was miserable and was returned two months later thin with ulcers. She was treated at Toby’s Legacy and she has been fine since. Cali requires people attention and horse companionship and doesn’t do well just sitting in a corral. Generally low man on the totem pole, there seems to be no rhyme or reason to who she likes. An ideal home for Cali would be with someone who appreciates the personality of an Arabian and doesn’t have a strong need for their own personal space – because Cali will be in it! For all Toby’s Legacy rescues we hope for a paddock or pasture with other horses and an effort create as natural an environment as possible. Sadly, Cali was returned through no fault of her own, and is again, looking for her forever family. Congratulations to Cali and the Pesquiera family. Cali has been adopted!!!! !